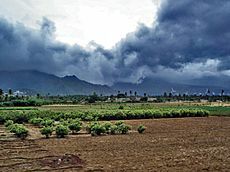 Advancing monsoon clouds and showers in Aralvaimozhy, near Nagercoil, India. A monsoon is a seasonal wind which lasts for several months. The word was first used in English for the seasonal rains in the Indian subcontinent. These rains blow in from the Indian Ocean and Arabian Sea in the southwest bringing heavy rainfall to the area. Monsoons also occur in other regions such as in North America, Sub-Saharan Africa, Brazil and East Asia. The mechanism is simple: land heats up faster than water. The temperature difference between the land and sea can be as much as 20°C – land temperatures in India can be hotter than 45°C, while the surrounding water in the Bay of Bengal and the Arabian Sea remains in the low 20s. The heat absorbed by the land warms the air above it. The hot air rises, and cooler ocean air rushes inland to replace it. As it moves, it carries moisture with it, releasing it over land as the summer monsoon (also known as southwest monsoon). The hot air over the land tends to rise, creating an area of low pressure. This creates a steady wind blowing toward the land, bringing the moist near-surface air over the oceans with it. Rainfall is increased by the moist ocean air being lifted upwards by mountains, as with the Tibetan Plateau, and by surface heating. The monsoon of western Sub-Saharan Africa is the result of the seasonal shifts of the Intertropical Convergence Zone and the great seasonal temperature and humidity differences between the Sahara and the equatorial Atlantic Ocean. It migrates northward from the equatorial Atlantic in February, reaches western Africa on or near June 22, then moves back to the south by October. The dry, northeasterly trade winds, and their more extreme form, the harmattan, are interrupted by the northern shift in the ITCZ and resultant southerly, rain-bearing winds during the summer. The semiarid Sahel and Sudan depend upon this pattern for most of their precipitation. The North American monsoon (NAM) occurs from late June or early July into September, originating over Mexico and spreading into the southwest United States by mid-July. It affects Mexico along the Sierra Madre Occidental as well as Arizona, New Mexico, Nevada, Utah, Colorado, West Texas and California. It pushes as far west as the Peninsular Ranges and Transverse Ranges of Southern California, but rarely reaches the coastal strip (a wall of desert thunderstorms only a half-hour's drive away is a common summer sight from the sunny skies along the coast during the monsoon). 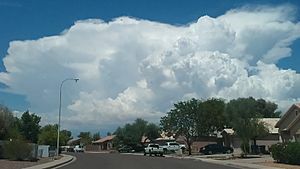 The North American monsoon is known to many as the Summer, Southwest, Mexican or Arizona monsoon. It is also sometimes called the Desert monsoon as a large part of the affected area are the Mojave and Sonoran deserts. However, it is debatable whether the North and South American weather patterns with incomplete wind reversal should be counted as true monsoons. 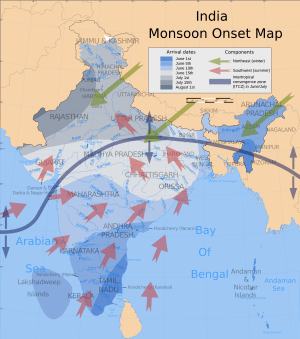 The Asian monsoons may be classified into a few sub-systems, such as the Indian Subcontinental Monsoon which affects the Indian subcontinent and surrounding regions including Nepal, and the East Asian Monsoon which affects southern China, Taiwan, Korea and parts of Japan. The southwestern summer monsoons occur from July through September. The Thar Desert and adjoining areas of the northern and central Indian subcontinent heat up considerably during the hot summers. This causes a low pressure area over the northern and central Indian subcontinent. To fill this void, the moisture-laden winds from the Indian Ocean rush into the subcontinent. These winds, rich in moisture, are drawn towards the Himalayas. The Himalayas act like a high wall, blocking the winds from passing into Central Asia, and forcing them to rise. As the clouds rise their temperature drops and precipitation occurs. Some areas of the subcontinent receive up to 10,000 mm (390 in) of rain annually. The southwest monsoon is generally expected to begin around the beginning of June and fade away by the end of September. 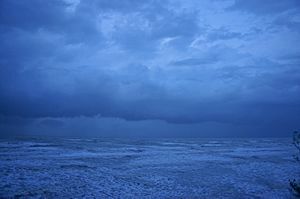 The moisture-laden winds on reaching the southernmost point of the Indian Peninsula, due to its topography, become divided into two parts: the Arabian Sea Branch and the Bay of Bengal Branch. The Arabian Sea Branch of the Southwest Monsoon first hits the Western Ghats of the coastal state of Kerala, India, thus making this area the first state in India to receive rain from the Southwest Monsoon. This branch of the monsoon moves northwards along the Western Ghats (Konkan and Goa) with precipitation on coastal areas, west of the Western Ghats. The eastern areas of the Western Ghats do not receive much rain from this monsoon as the wind does not cross the Western Ghats. The Bay of Bengal Branch of Southwest Monsoon flows over the Bay of Bengal heading towards North-East India and Bengal, picking up more moisture from the Bay of Bengal. The winds arrive at the Eastern Himalayas with large amounts of rain. Mawsynram, situated on the southern slopes of the Khasi Hills in Meghalaya, India, is one of the wettest places on Earth. After the arrival at the Eastern Himalayas, the winds turns towards the west, travelling over the Indo-Gangetic Plain at a rate of roughly 1–2 weeks per state, pouring rain all along its way. June 1 is regarded as the date of onset of the monsoon in India, as indicated by the arrival of the monsoon in the southernmost state of Kerala. The monsoon accounts for nearly 80% of the rainfall in India. Indian agriculture (which accounts for 25% of the GDP and employs 70% of the population) is heavily dependent on the rains, for growing crops especially like cotton, rice, oilseeds and coarse grains. A delay of a few days in the arrival of the monsoon can badly affect the economy, as evidenced in the numerous droughts in India in the 1990s. The monsoon is widely welcomed and appreciated by city-dwellers as well, for it provides relief from the climax of summer heat in June. However, the roads take a battering every year. Often houses and streets are waterlogged and slums are flooded despite drainage systems. A lack of city infrastructure coupled with changing climate patterns causes severe economic loss including damage to property and loss of lives, as evidenced in the 2005 flooding in Mumbai that brought the city to a standstill. Bangladesh and certain regions of India like Assam and West Bengal, also frequently experience heavy floods during this season. Recently, areas in India that used to receive scanty rainfall throughout the year, like the Thar Desert, have surprisingly ended up receiving floods due to the prolonged monsoon season. The influence of the Southwest Monsoon is felt as far north as in China's Xinjiang. It is estimated that about 70% of all precipitation in the central part of the Tian Shan Mountains falls during the three summer months, when the region is under the monsoon influence; about 70% of that is directly of "cyclonic" (i.e., monsoon-driven) origin (as opposed to "local convection"). Around September, with the sun fast retreating south, the northern land mass of the Indian subcontinent begins to cool off rapidly. With this air pressure begins to build over northern India, the Indian Ocean and its surrounding atmosphere still holds its heat. This causes cold wind to sweep down from the Himalayas and Indo-Gangetic Plain towards the vast spans of the Indian Ocean south of the Deccan peninsula. This is known as the Northeast Monsoon or Retreating Monsoon. While travelling towards the Indian Ocean, the dry cold wind picks up some moisture from the Bay of Bengal and pours it over peninsular India and parts of Sri Lanka. Cities like Chennai, which get less rain from the Southwest Monsoon, receive rain from this Monsoon. About 50% to 60% of the rain received by the state of Tamil Nadu is from the Northeast Monsoon. In Southern Asia, the northeastern monsoons take place from October to December when the surface high-pressure system is strongest. The jet stream in this region splits into the southern subtropical jet and the polar jet. The subtropical flow directs northeasterly winds to blow across southern Asia, creating dry air streams which produce clear skies over India. Meanwhile, a low pressure system known as a monsoon trough develops over South-East Asia and Australasia and winds are directed toward Australia. The East Asian monsoon affects large parts of Indo-China, Philippines, China, Taiwan, Korea and Japan. It is characterised by a warm, rainy summer monsoon and a cold, dry winter monsoon. The rain occurs in a concentrated belt that stretches east-west except in East China where it is tilted east-northeast over Korea and Japan. The seasonal rain is known as Meiyu in China, Jangma in Korea, and Bai-u in Japan, with the latter two resembling frontal rain. The onset of the summer monsoon is marked by a period of premonsoonal rain over South China and Taiwan in early May. From May through August, the summer monsoon shifts through a series of dry and rainy phases as the rain belt moves northward, beginning over Indochina and the South China Sea (May), to the Yangtze River Basin and Japan (June) and finally to North China and Korea (July). When the monsoon ends in August, the rain belt moves back to South China. Also known as the Indo-Australian Monsoon. The rainy season occurs from September to February and it is a major source of energy for the Hadley circulation during boreal winter. The Maritime Continent Monsoon and the Australian Monsoon may be considered to be the same system, the Indo-Australian Monsoon. It is associated with the development of the Siberian High and the movement of the heating maxima from the Northern Hemisphere to the Southern Hemisphere. North-easterly winds flow down Southeast Asia, are turned north-westerly/westerly by Borneo topography towards Australia. This forms a cyclonic circulation vortex over Borneo, which together with descending cold surges of winter air from higher latitudes, cause significant weather phenomena in the region. Examples are the formation of a rare low-latitude tropical storm in 2001, Tropical Storm Vamei, and the devastating flood of Jakarta in 2007. The onset of the monsoon over the Maritime Continent tends to follow the heating maxima down Vietnam and the Malay Peninsula (September), to Sumatra, Borneo and the Philippines (October), to Java, Sulawesi (November), Irian Jaya and Northern Australia (December, January). However, the monsoon is not a simple response to heating but a more complex interaction of topography, wind and sea, as demonstrated by its abrupt rather than gradual withdrawal from the region. The Australian monsoon (the "Wet") occurs in the southern summer when the monsoon trough develops over Northern Australia. Over three-quarters of annual rainfall in Northern Australia falls during this time. The European Monsoon (more commonly known as the return of the westerlies) is the result of a resurgence of westerly winds from the Atlantic, where they become loaded with wind and rain. These westerly winds are a common phenomenon during the European winter, but they ease as spring approaches in late March and through April and May. The winds pick up again in June, which is why this phenomenon is also referred to as "the return of the westerlies". The rain usually arrives in two waves, at the beginning of June and again in mid- to late June. The European monsoon is not a monsoon in the traditional sense in that it doesn't meet all the requirements to be classified as such. Instead the return of the westerlies is more regarded as a conveyor belt that delivers a series of low pressure centres to Western Europe where they create unsettled weather. These storms generally feature significantly lower than average temperatures, fierce rain or hail, thunder and strong winds. The return of the westerlies affects Europe's Northern Atlantic coastline, more precisely Ireland, Great Britain, the Benelux countries, Western Germany, Northern France and parts of Scandinavia. Monsoon clouds over Lucknow, Uttar Pradesh. Western Ghats on May 28 in dry season, 2010. Western Ghats on August 28 in rainy season, 2010. Monsoon Facts for Kids. Kiddle Encyclopedia.